Last week I was in San Francisco, on my way home from southern California, and got delayed because I needed some emergency work done on my vehicle. While waiting for the work to be done, I walked to a local coffee shop and pretty much camped out there for a large part of the day. I spent most of that time on my computer and chatting with a man named Tristan, who was sitting at the next table. The conversation wound around to the fact that I am a rug weaver, etc. He said that his father had built some looms over the years. I asked him who his father is, and was amazed to learn that he was the man who built my custom-made rug loom! 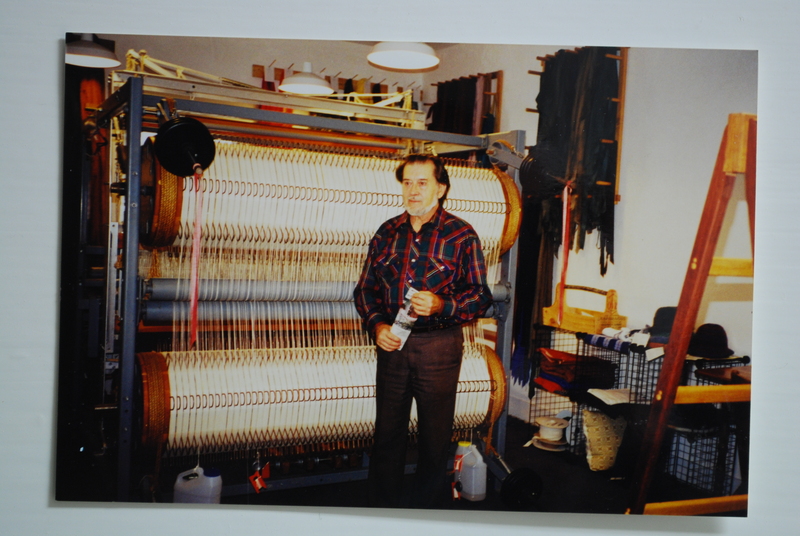 I blogged some time ago about my loom and that it was built by John Bettencourt. Building looms was not his occupation, but he did make some very specialized looms for special purposes. I had been carrying John’s contact information around in a notebook for a few years, after taking a workshop in Mendocino from a woman who had one of his looms, albeit a loom for a very different type of rug weaving. When I contacted John about the possibility of making a shaft switching loom for me, he said he was no longer doing that kind of work, but referred me to a woman he had built such a loom for sometime in the early 1990s. She was no longer weaving and wanted to sell her loom. Long story short, I contacted her, went to see the loom, and bought it in late 1999. It was a real leap of faith, as the loom was in pieces on her garage floor and had some rust and corrosion on it There was a bit of standing water on the garage floor and parts of the loom were in it. She had not used it in at least three years, so couldn’t give me a whole lot of information on its workings. There was no manual; it was hand made. And it is not an ordinary loom! It is made of mostly steel, some aluminum and some wood. It probably weighs half a ton. I wondered what on earth I had gotten myself into. A friend of mine offered her husband’s engineering expertise to help me assemble the thing and John kindly sent several photos, which helped immensely, but a lot of it was still a lot of guesswork. When we got it all together, I couldn’t make it work. I called John to see if he could offer more insight and he said he would soon be coming through Eureka from Cottage Grove, OR, and would stop by my studio to help me figure it out. I had only talked to him over the phone up to then, so it was a pleasure to meet him for he first time. He easily diagnosed the problem. I had some turnbuckles hooked up incorrectly. Once that was changed, I was off and running. Here is a photo of John, taken on his first visit to my studio. Not the best photo, as it was taken with a film camera and this version is a photo of my original photo. problems that came up, and whenever he was going through Eureka, he and his wife would stop by my studio. He was always helpful. Katreen was a liturgical weaver and if I have the story right, John built her a better loom than the commercial one she had been using, and then other people asked him to build them a specialized loom of some sort, etc. John told me that he had built one other loom like mine for a weaver in Maine, but I have never been able to track her down. It would be nice to be able to contact her and compare notes on problems that come up and we solve them. If somehow this blog post gets out far and wide and any reader knows about the other John Bettencourt shaft-switching loom, I would love to be in touch. I had not been in touch with John and Katreen in the last two years. Usually I contact them around the holidays via a greeting card, and then we talk on the phone. I was making long road trips to the east coast in the fall the last few years, and by the time I got home and resettled, I was not diligent about sending holiday cards or letters. Tristan told me that John died in August, 2013. I was sad to hear that news and sorry I didn’t know about it sooner. I think John was pleased that I continue to use the loom and enjoy it. It has lots of idiosyncrasies and some contrariness, but I love it dearly. It helps me make tightly woven, sturdy rugs. As for the chance meeting with Tristan (who I did not even know existed, and whose father happened to build specialty looms, one of which I own) it was because my brakes failed and I had to spend an extra day in San Francisco, and I picked that particular coffee shop just by chance. That made it all worthwhile! Tristan, if you read this blog post and see any errors, please let me know. It was a real pleasure to meet you. 2 Responses to "Chance Encounter"
Hi Nancy, I just found your blog and enjoyed reading it! I am subscribing. Thanks! Thanks, Linda. It is nice to get a “real” comment instead of someone wanting to sell me something totally unrelated.